With iPhone Apps each selling for a dollar or two, it's a numbers game. Fundamental marketing rules apply, such as defining your target audience and identifying how to reach them. However, this medium requires insight as to what's technically possible within Apps, how the iPhone App Store works and how social media can be leveraged to spread the word. My hope is that the blog is a practical guide for accomplished developers and expert marketers alike. Apple celebrates the one-year anniversary of the App Store this week. With more than 60,000 Apps accumulated in that time, the launch of a new App can easily get lost. That is why GS Marketing Group, Inc., a leading App developer, assembled a list of 50 (and still growing) ways to promote iPhone Apps, available as a blog article at TimCascio.Wordpress.com. "iPhone Apps are a new addition to an integrated marketing plan, and I think people are unsure where to begin their marketing and promotional efforts," said author Timothy Cascio, managing partner at GS Marketing Group. "Fundamental marketing rules apply, such as defining your target audience and identifying how to reach them. However, this medium requires insight as to what's technically possible within Apps, how the iPhone App Store works and how social media can be leveraged to spread the word. My hope is that the blog is a practical guide for accomplished developers and expert marketers alike." For existing brands, a close look at current customer touch points can uncover a number of easy-to-implement, but often overlooked, promotional ideas. For new brands, publicity, social media and sponsorship opportunities play a larger role in the overall campaign. Whether an existing brand or a new one, a mobile audience is at times more receptive to marketing messages than others. When and where mobile users spend their time in a captive environment is an outlet for consideration. Examples include advertising within complementary Apps, themed podcasts and at transit stations. Publicity, promotions and advertising should coincide with the pre-release and release of Apps. The best shot at earning a Top Seller position within an iPhone App Store category is when all marketing efforts leverage one another. Marketers are reminded that nothing holds back the full potential of an App like poor ratings and reviews. Mobile Apps require a commitment to marketing and ongoing product development to ensure long-term success. Acting upon insightful feature requests submitted by users will keep customers coming back and lure new ones into the fold. Rob Walch, host of the popular Today in iPhone podcast said of the article, "This is, without a doubt, the most thorough list I've seen talking about different ways to promote your App. A must read." 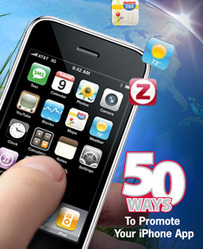 Cascio's blog and the ''Mobile Marketing: 50 Ways to Promote Your iPhone App'' article may be viewed at http://TimCascio.Wordpress.com . GS Marketing Group, Inc., is a full-service firm that specializes in the strategy, development and marketing of mobile applications. For more information about mobile application development and GS Marketing Group's suite of services, visit http://www.GSMarketingGroup.com .